Unintentional injuries are common among children aged 14 years and under.Young children under 4 years are at the greatest risk from unintentional injuries in the home because it is where they spend the majority of their time. As children grow older, they spend less time in the home and incidence of home injuries diminishes. These are very common in India. Burns are commonly caused by hot water, which may be in a teapot or boiling in a pan, in a bucket in the bathroom or boiling water from taps. The child reaches up to the pan, not knowing what it contains. Out of curiosity he may put his hand into it or may spill it on himself thereby burning his hands, legs and abdomen. >	Do not drink hot beverages when a child is sitting in your lap. > Coffee and teapots should not be left on the table. Table cloths should not hang down so that the child is able to pull it and overturn things on to him. > The geyser temperature for hot water should not be set higher than 125 degree F. Do not leave your child alone in the bathroom with a bucket of hot water. >	It is better not to use steam vaporizer for the child. Nebulizers are a better option when indicated. >	Always check the temperature of hot water with the back of your hand before you wash the child. > Young children should not be allowed to play near hot ovens. Try not to have the child with you when you are cooking in the kitchen. >	Place guards in front of heaters, and the iron should be unplugged when not in use. >	Kerosene stoves are a common cause of burns. Fix the stove in such a way that it is stable and will not topple easily. > Chemicals like strong acids, alkalies, caustic soda and some dyes cause burns. All these chemicals should be kept locked. > Synthetic materials like nylon are liable to catch fire easily. Ensure that your child is not wearing clothes made of such material and keep him away from any source of fire. > Children are very fond of lighting matches and blowing out flame. Matches and lighters should not be accessible to children. >	In case of scalds take off the clothes immediately. >	Flood the burn area with tap water. Don?t use ice cold water. >	For chemical burns, flood the burnt area with plenty of water. > Burned area should be cooled with running tap water. Cooling the burnt area for a few minutes is worth the effort because heat can damage the tissues of the body for quite sometime even after the source of heat has been removed. >	Do not apply any ointment, toothpaste oil or cream to the burn. >	The burn can be covered with a clean dry thin sheet. >	If blisters have formed do not prick them because it will expose the burn area to unnecessary infection. >	For small burns, you can apply antiseptic cream on your doctor?s advice. Paracetamol may be given to relieve the pain. >	For large, extensive burns, the child should be taken to the nearest hospital. 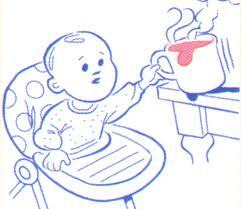 > Do not give milk or food to the child since he may require anesthesia in hospital. Otherwise the child may vomit and aspirate.